Over the course of the winter term our students (at the Johannes Gutenberg-University in Mainz, Germany) have to complete different practical projects in groups. They also have to document the progress and insights of their projects. They are allowed to use different digital tools, which can help them to organize and improve their projects. These tools can be also used for mobile learning and working together. 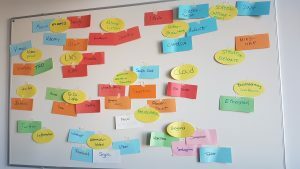 During our first meeting on Friday we brainstormed about the digital tools they know and the purpose or learning scenario for which they could be used. The picture above shows the output of the group.